These days we depend on the Internet for almost everything! – for communication, daily professional use and researching new products to satisfy our needs. The web empowers our decision making process – which is why inbound marketing has made such an impact. Inbound marketing works by tailoring content to a specific need. While, outbound marketing tends to focus on “buying” the market and pushing unwanted offers in intruding ways. We rely on inbound marketing for the way we do business, but what’s really in our inbound tool box? Today, we would like to share some of the marketing tools that help us do our job more efficiently and effectively, as well as some of the tools we admire! Social media is an essential element for lead generation and inbound marketing. According to our friends at HubSpot, social media drives the highest level of leads. Let’s take a look at some of the social media tools we have found particularly blog-worthy for inbound marketing. HubSpot Social Inbox: HubSpot Social Inbox focuses on social activity to increase visibility, interaction history, and delivering integrated tools to simplify your data research. HubSpot social inbox helps you prioritize your social media leads and monitor their activity. It’s very evident how many people interact on at least one social media platform, so why not use it to your advantage? Twitter Hashtags: I know it sounds simple, but Twitter hashtags are a very effective way to market a specific event or promotion. Hashtags are extremely useful for marketers because you don’t need to create a separate event or profile page… Instead, you can create an event-specific hashtag and monitor the discussion from there. – Don’t forget to check out our social media efforts and follow us on Twitter! Optimizing your website for SEO is a very important part of inbound marketing as well. You need to ensure that your website is consistent, crawl-able, and is ranking higher than the competition. Let’s take a look at a few SEO tools that are helpful for the savvy SEO analyst. Free Site Crawler Tools: Free tools like Screaming Frog, Xenu and GSite, allow you to crawl your entire site and reduce the amount of broken links and URL’s on your website for an SEO friendly webpage. Having a trusted SEO tool is essential for effective SEO, as well as providing your clients with a comprehensive website. Search Engine Rankings: The rank tracker from Moz allows you to track search engine rankings for pages and keywords. The specialized tool stores search engine rankings for easy comparison. You will be able to see which efforts are successful and sign up for notifications so you can stay connected to any changes. We are all about online visibility and utilizing our website as our best salesperson – with search engine rankings you can ensure your efforts are successful. Knowledge is power! From proper certification to educating your clients through specific mediums. Let's check out the tools we rely on to stay informed and current in the inbound world. Certification Classes: Certification classes are highly beneficial because they provide you with the education you need to excel in the marketing world. We personally admire the certification classes offered through HubSpot. HubSpot offers a variety of different classes to ensure you become a certified marketing pro! New Breed’s world class team is now even better at what they do thanks to the Inbound Certification class offered through HubSpot’s academy! Social Media: Social media is a fast and efficient way to stay current with news and trends. Stay ahead of the game by connecting with savvy marketers and professionals. Some of our personal favorites? @HubSpot, @B2Community, @smexaminer and more! These knowledgeable sources share valuable content and news that can help you become more inbound confident. Resource Center / Blog: As a marketer, you probably produce a lot of content. Housing all this content in a resource library or blog on your website is a great way to promote that content. By having a resource center, that is updated regularly, it becomes a place that people continue to return to in search of valuable, relevant content. You become a resource for your prospects and customers. There are countless options when it comes to picking premium tools for your inbound marketing toolbox. Here are some of our FREE favorites... Yes, we said free. GoToMeeting: Digital marketers need to collaborate with a variety of different people and with GoToMeeting you can hold unlimited online meetings with over 20 attendees. New Breed’s team uses GoToMeeting daily! You can also host webinars with GoToWebinar which is another valuable content offer to help generate leads. HubSpot: HubSpot is one of the most renowned inbound marketing software platforms that helps companies attract visitors, convert them into leads and close them into customers. This reliable tool focuses on attracting buyers, not disturbing them. HubSpot can give you the education you need to create valuable content and attract your ideal market. HubSpot will help you harness the power of inbound marketing to start giving your company a competitive advantage in the business world. Successful inbound marketing relies on many different tools to meet goals and implement campaigns with ease. 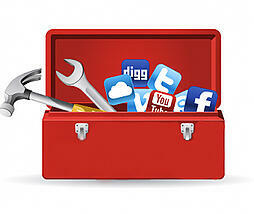 We would love to hear about the tools you rely on, as well as the tools you admire in the inbound marketing world!